The item is already assembled; no assembly is required. ➤I dealfor use as a decorative feature, occasional chair, e.t.c. ➤ Seat height from the ground: 39 cm. ➤ Seat width: 52 cm. ➤ Seat depth: 43 cm. Feel free to collect from Aston in Birmingham. We will describe any serious imperfections. As you can see a lovely chair that would adorn any interior. Lovely lived in distressed look! We will describe any serious imperfections. Feel free to collect from Aston in Birmingham. As you can see a lovely chair that would adorn any interior. Two Retro Butterfly Chair Real Leather Dark Tan Firm Seat Metal Hairpin Frame Lounge. Condition is Used, Some Marks and scuffs that could be repaired. Sold as a pair only. Collection in person only. 72 c.m, width 58 c.m, depth 80 c.m. Feel free to collect from Aston in Birmingham. We will describe any serious imperfections. As you can see a lovely pair of chairs that would adorn any interior. Lovely lived in distressed look with a rip to the seat on each chair on the seam. The fabulous cherry curves around beautifully to form the most attractive feature of the chair, while it also provides essential back support too. Luxurious white faux leather covers the seating cushion as well as the padded back cushion which is placed intuitively for perfect support. The chairs have been re upholstered in a light brown material. We will describe any serious imperfections. Feel free to collect from Aston in Birmingham. We will describe any serious imperfections. As you can see a lovely pair of chair that would adorn any interior. Lovely lived in distressed look! Feel free to collect from Aston in Birmingham. 83 c.m, width 80 c.m, depth 85 c.m. The chair is lightweight and comfortable. Assembly is easy. Its iconic butterfly design is very popular and will suit any setting. Seat height from the ground: 53 cm. Seat width: 59 cm. It is your responsibility to be in to receive, check and sign for your goods. This is your opportunity to ensure you are happy with your order. It is your responsibility to be in to receive your goods. Super comfy! That hasn’t affected the chair structurally. There are wear marks to the legs from age and use. • As the photos show - this is in need of a little TLC. The leather is in overall good used condition but would benefit from a clean! 83 c.m, width 80 c.m, depth 85 c.m. Feel free to collect from Aston in Birmingham. We will describe any serious imperfections. As you can see a lovely chair that would adorn any interior. Lovely lived in distressed look! A superb chesterfield club chair in a dark brown leather. Iconic design with chunky arms and back fully buttoned and hand studded detail to front. Thick foam filled seat cushion makes the chair very comfy. Ideal in the home or for a pub / club or man cave. Overall the chair is in good condition, has been cleaned and treated with leather balm. Brighton Leather Mid Century Modern Sofa – Matcha Green. The sofa is inspired by the 1950s Poul Jensen design for Selig. The seat is available in two colours: hickory brown or matcha. The sofa has a minimalist design that would suit most interiors. Retro Acacia Solid Wood & Leather Sling Chair. Made of solid Acacia wood. A super stylish sling chair in a retro simple style creating a stunning chair with an on trend look. Genuine Distressed Leather. A superb chesterfield club chair in a golden brown leather. Thick foam filled seat cushion makes the chair very comfy. Overall the chair is in good condition, has been cleaned and treated with leather balm. The seat section is filled with a high density fibre and is covered with supple faux leather. This is Swivel Retro Armchair is available in grey faux leather colour in a luxury finish. You will not find this Swivel Retro Armchair anywhere else at such a competitive price! The chair is finished in a piped leather. Feel free to collect from Aston in Birmingham. Brighton Leather Mid-century Z Lounge Chair – Hickory Brown. The chair is available in two colours: hickory brown or matcha. Your order will be placed exactly as submitted. If you have uneven flooring it may have an adverse effect on the stability of the furniture. Feel free to collect from Aston in Birmingham. We will describe any serious imperfections. Looking for a comfortable chair?. The back and sides of the seat curve around the unit to form the most eye catching feature, and this supplies equal proportions of luxury comfort and elegant design. The chairs are finished in their original brown button back leather standing on Queen Anne legs. Feel free to collect from Aston in Birmingham. We will describe any serious imperfections. As you can see a lovely pair of chairs that would adorn any interior. The sofa is inspired by the 1950s Poul Jensen design for Selig. The seat is available in two colours: hickory brown or matcha. Brighton Leather Mid Century Modern Sofa – Hickory Brown. The sofa has a minimalist design that would suit most interiors. 'Derry' Leather Armchair. Introducing the 'Derry' leather armchair. Place this armchair in a bar or cafe, or in a study, hallway or living room. Choose one colour as a standalone piece, or mix and match across the range for a more eclectic appearance. Ht 86 c.m, width 66 c.m, depth 78 c.m. We will describe any serious imperfections. DANISH LEATHER ARMCHAIR by STAR. The armchair is in very good condition. 100% Genuine leather. Colour - Turquoise. Tan Woven Leather Lazy Chair. Cancelations accepted - orders can only be cancelled prior to dispatch. Weight 7kg. Height 73cm. Depth 87cm. Width 62cm. This item will arrive fully assembled. Handwoven Genuine Leather. 2 Maskreys Cream Leather Chairs. One swivel and the other is a recliner, comes with button back feature and the other parallel stitching feature and are in excellent condition. They are mahogany wood and have been sparingly used. Conker Brown Leather Egg Chair. The leather upholstery is slightly distressed to give it an aged appearance. The chair is available in two colours: Matcha and Conker brown. Your order will be placed exactly as submitted. The seat section is filled with a high density fibre and is covered supple black faux leather. ☆ Trendy bucket style design | Supple faux leather | Padded seat. Height To Seat - 39 cm. We stand behind our products. The chair is available in conker brown and chestnut leather. Pair of Ludlow Leather Mid Century Modern Chairs in Chestnut Brown. The chair features ribbed stitching and a wingback design. Its curvy shape oozes retro charm, which would add plenty of mid-century modern style to an interior. ☆ Supple faux leather | Padded seat. Height To Seat - 54 cm. We stand behind our products. ☆ Solid stainless steel base. ☆ Is supplied with a protective rubber base. A : We have a very accurate inventory system that updates every hour. Bought for £1,600. We had to fix one of the front legs underneath when one of our very large male friends fell on it at a party a year ago and made one of the front legs loose. Therefore the underneath doesn’t look perfect, but you can’t see this when the chair is in use. Pair of Brighton Leather Mid-century Z Lounge Chairs – Matcha Green. The chair is available in two colours: hickory brown or matcha. Your order will be placed exactly as submitted. If you have uneven flooring it may have an adverse effect on the stability of the furniture. Brighton Leather Mid-century Z Lounge Chair – Matcha Green. The chair is available in two colours: hickory brown or matcha. Your order will be placed exactly as submitted. If you have uneven flooring it may have an adverse effect on the stability of the furniture. Gina Chair Teak Antique Brown Leather. Cancelations accepted - orders can only be cancelled prior to despatch. Weight 8kg. Height 68cm. Depth 82cm. Width 64cm. Living Room. The chair is available in two colours: hickory brown or matcha. 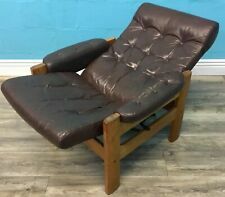 Pair of Brighton Leather Mid-century Z Lounge Chair – Hickory Brown. Your order will be placed exactly as submitted. If you have uneven flooring it may have an adverse effect on the stability of the furniture.